It’s been a major trend in furniture and interior design – and, now, the wood tones we’re loving in our homes and offices are extending into another space: drinkware. Our new collection of insulated wood tone tumblers are taking a page from this comfy, cozy and completely chic trend – and we can’t get enough. Our advice? Dive into this trend now. Mixed wood tones and wood grains are the interior trend for 2019 – so consider these tumblers a little piece of home whether you’re stuck in the car or stuck in the conference room. Inspired by the organic finishes everyone’s opting for, consider these tumblers your cue to make yourself at home anywhere. One of the reasons the wood grain trend has gained such momentum is that it has a very natural, very organic richness – and the same goes for this tumbler collection. These tumblers look as sleek and sturdy as they are, without looking busy or over-the-top. While we’re all about branded drinkware, we’ve seen some that are a little too aggressive. If that’s your brand persona, great, but if you’re looking for something more polished, more sophisticated and more established, these wood tone tumblers make sense. With brands like S’Well® and Corkcicle® pushing their collections to retail – and let’s not forget the iconic Mercedes-Benz® wood grain tumbler – your customers have no doubt been craving one of these cool cups. Getting one from you will solidify their perception of you and your brand. 4. Because they’re high quality insulated tumblers – and who doesn’t want that? Beyond the cool factor, these tumblers are high quality, high performance products that keep drinks cold for up to 12 hours and hot for up to eight. 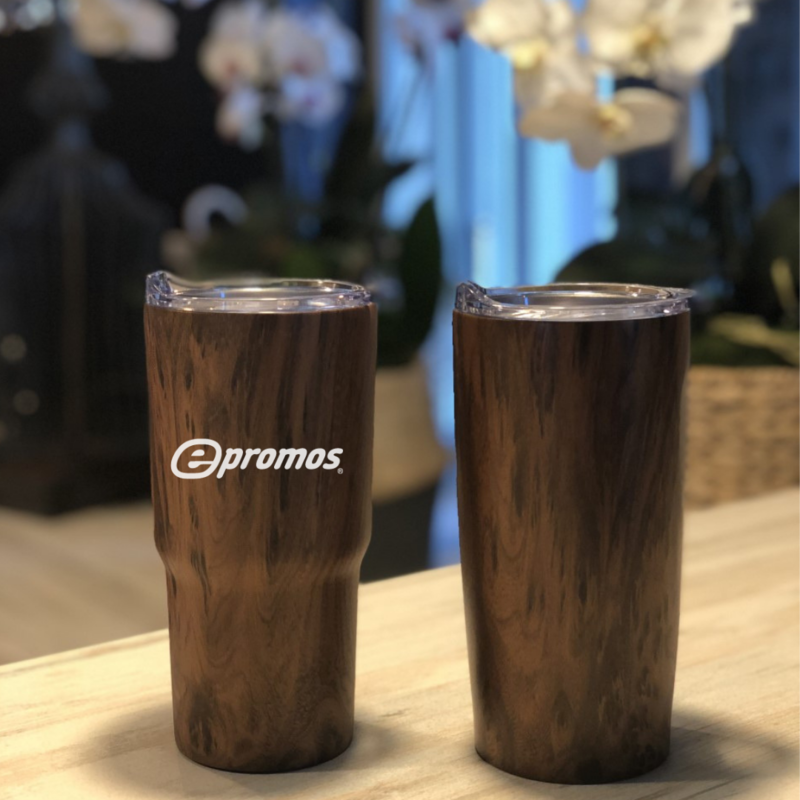 Check out the classic 20 ounce Vacuum Insulated Wood Grain Tumbler, the tapered 20 ounce version and the 10 ounce Wine Tumbler, all with this on-trend wood finish. We’re hearing this is just the beginning of the wood grain trend – and we can’t wait to see what’s next. Get in touch with us, The Promo Know-How People, to learn more and start customizing your tumbler order. Wood grain is a popular home and furniture trend – and now, with this collection of wood grain drinkware, the hot trend can promote your brand too. Looking for more of our top picks and best sellers? Click here. Love keeping up with the latest promo trends? Follow us on Facebook, Instagram, Twitter, Linked In and Pinterest!